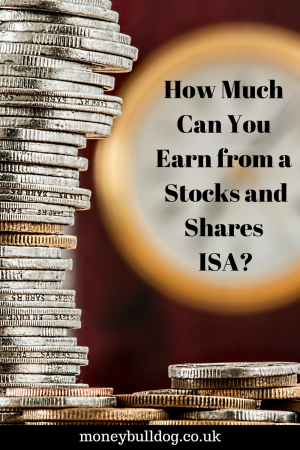 The first thing to understand is that there are many different Stocks and Shares ISAs on the market. How much you can expect to receive in return, then, will depend on how well each provider performs. It will also be affected by what kind of investment risk you are willing to accept. On top of this, it’s important to take into account the management fees charged by each provider. How Much Risk Will You Take? With investments, the more risk you are willing to take the higher the potential return will often be. The risk that you could lose some or all of your investment will also be greater, of course. Many Stocks and Shares ISA providers will offer you a choice of funds that you can invest in. Each of these fund options will carry a given degree of risk and potential growth rate attached. These figures are only to be used as a guide, as with investments things do not always go as expected. To see how the annual growth rate of your ISA might affect your return as the years go by, check out this ISA calculator* from ISA provider Hargreaves Lansdown. The calculator will show you how your money could grow based on many factors. These include how much you invest, how long you invest for and the projected annual percentage growth rate. Another factor that could affect the return on your Stocks and Shares ISA are the fees charged by your provider. These could be management charges for managed ISAs, share trading fees for DIY ISAs or even overall charges for simply holding funds or investments in your ISA account. You can see an example of how these fees work in practise with the ISA provider we mentioned earlier on this page*. One option to minimise the fees you pay is to take advantage of any special deals being offered. We recently secured a deal for our readers with the digital wealth manager and ISA provider Wealthsimple*, for example. The deal enables you to get your first year of ISA investments of up to £5000 managed for free. To benefit from this offer you will need to sign up via this link* or one of the other Wealthsimple links on our blog. One more variable that will affect the return is how well the stock market performs during your investment period. Stocks and Shares ISAs have performed well against their Cash ISA cousins in recent years because stock markets have performed well, while at the same time interest rates have remained low. If stock markets and the economy were to perform badly in coming years then this could affect your return. This being said, good ISA managers may be able to limit any losses or maintain growth by re-balancing your portfolio. The reason we haven’t given any hard figures in this post is because there are a lot of factors involved. Your return can depend on many things such as which ISA provider you choose, the fees they charge, the level of risk you’re willing to take on and how the stock market and economy perform as a whole. Still, taking a few moments to have a play around with an ISA calculator* should give you some idea as to what return you might get back on your investment in the coming years based on various levels of potential growth.